It is hard to exaggerate the need for increased funding for the NHS. The health service is threatened by a funding gap which could be as large as £30 billion per year by 2020. Even if current yearly efficiency gains were doubled by 2020, it could still be looking at an annual funding gap of £16 billion. Further savings due to efficiency improvement seem optimistic, considering our ageing population and rising levels of chronic disease. More than a quarter of healthcare trusts finished the 2013/14 financial year in deficit, directly threatening the provision of services in some areas. The NHS’s rising financial unsustainability could threaten its very existence unless we are bold enough to take effective action. We need patients to take more responsibility for their own healthcare and health affecting behaviour. In this paper, Dr Christoph Lees and Edmund Stubbs set out the case for an NHS contribution scheme which could generate increased income in a progressive manner while reducing overall demand for already stretched services. It would encourage patients to become involved in their healthcare and thus modify their lifestyles. Contributors would be highly aware of their own standard care budget, using it, with increased flexibility, at NHS or non-NHS providers of their choice, sometimes with extra, out of pocket payments. 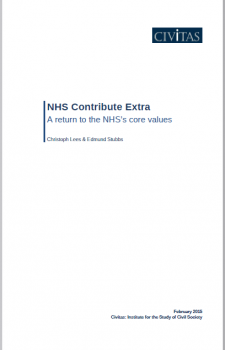 “The proposed voluntary contribution scheme will aid the restoration of the current NHS model to its original founding values, as envisaged by William Beveridge,” they write. “The scheme will enable healthcare to be built more upon cooperation between the state and individuals, with the opportunity for individuals to voluntarily enhance their care above a substantial and secure minimum level that is already firmly established in the UK.